Change 5 above to whatever level of precision you require. I would always favour typing more code to make it more explicit, more readable and to ensure consistency in style throughout a software system. Minimising the bytes and lines needed to do something shouldn’t take preference over readability. 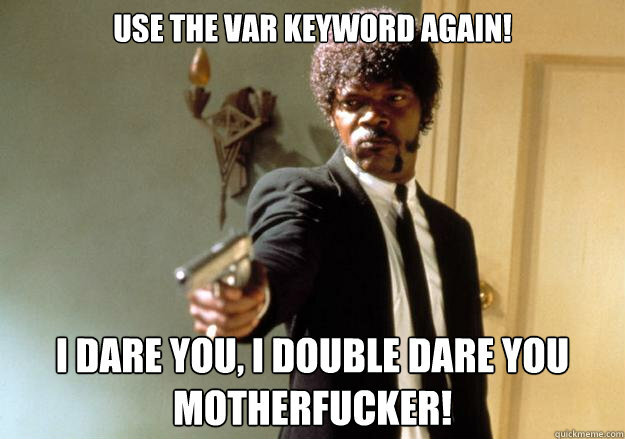 My two pet hates in this regard are the var keyword and ternary (?) if operator. which means you either have many instances of variable declarations which are hard to understand or inconsistent coding style. If var is used at all another developer will no doubt come along and use it inappropriately so I prefer to discourage its use. pop up in a code base which has instances of ? already for simple expressions. Again then for reasons related to removing ambiguity about the appropriateness or not of its use, I discourage writing if statements with the ternary operator. Code is read much more than its written so don’t save a couple of seconds using c# shorthand when writing it if it’s possible this will slow down those maintaining it.